We know how intense finding the gown can be. We are familiar with the “deer in headlights” overwhelmed look that many brides have upon entering our salon. We are thrilled, however, when they begin to enjoy the process and end up leaving relaxed and beaming with their dream dress secured. New York Bride & Groom of Raleigh offers an unparalleled selection of wedding dresses. Our knowledgeable bridal consultants know the right questions to ask and how to tastefully handle any challenges you may present. We invite you to find your dream wedding dress in our salon. Enjoy over 17,000 square feet of modern luxury that’s filled with sensational dresses. We pride ourselves on offering brides the latest designer options and fashion forward trends. If you have just seen it and fallen in love with it, we are happy to let you try it on. Ensuring our brides have the selection and style options they crave is one of our main goals. When a bride feels radiant from her core, she can’t help but glow. Our dedicated team of professionals can help you find the dress you desire. Our expert alterations department can ensure it fits you exactly the way you prefer. We have the experience, the gown selection and the competitive pricing to help you realize your wedding day dreams. When you are ready to shop for your dress, we will be ready for you. You are welcome to visit our salon at your convenience. We have 20 changing suites available and a consultant will be waiting to give you a hand. Bring the moms, the dads, your wedding party, sorority sisters or stop by alone on your lunch break. Whatever works for you, is awesome for us. We see many highly organized brides with notes and sketches of styles that they love. Scrapbooks of preferred silhouettes and saved images on your phone are definitely helpful when trying to pull the appropriate gowns. However, some brides don’t remember what they liked about a certain feature or why they took note of it. 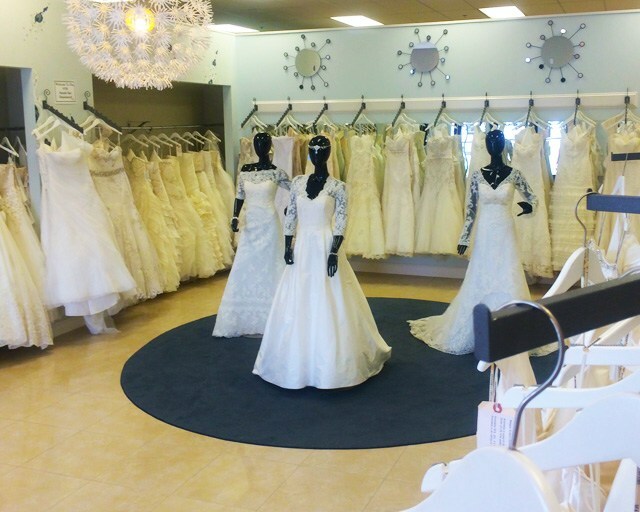 Our devoted staff can help you analyze your wish list in order to find you the perfect dress. That being said, an equal number of brides walk through the door with zero notes or earmarked magazines and simply let their intuition be their guide. Regardless of how you prefer to shop, our expansive selection of the best designers and popular pricing will enable you to find your dream gown. Our experienced consultants can recommend certain styles and cuts to flatter every body type. We have a tremendous selection of sample gowns on-hand to ensure that you are not basing this important decision on a picture. While we understand that finding your dress is priority number one, we also have a full bridesmaid dress department along with an in-house tuxedo rental department. Take care of your entire wedding party’s attire needs with the convenience of one-stop shopping. We love helping you simplify these epic decisions so you can focus on organizing the million other details of your big day.